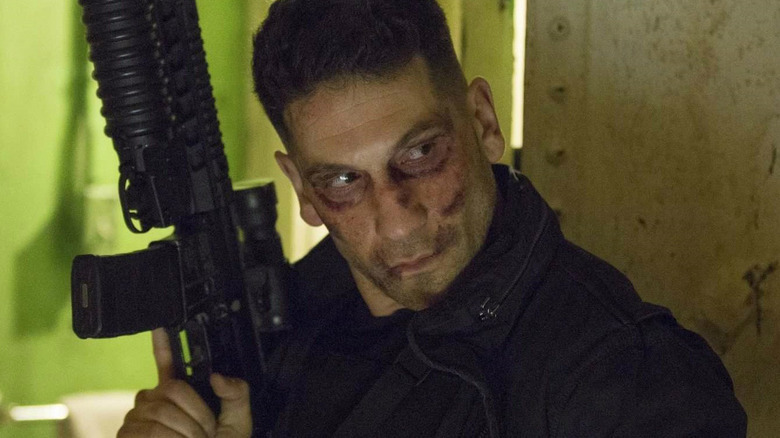 It's been especially difficult for Netflix to promote the first season of Marvel's The Punisher because of pervasive real-life gun violence, but star Jon Bernthal wants the show to help make a positive change. Bernthal (The Walking Dead) plays Frank Castle, a former Marine-turned vigilante after the killing of his family. Although the character is a martial arts expert and is dangerous with his bare hands, he's also known in the comics for his extensive arsenal of weapons. In an interview with USA Today, Bernthal said the violent content on the show can shine a light on the problems of society. "Art, at its absolute best, can hold a mirror to society and can make society look at and question itself," he said. "I don't think it's our job to answer those questions, but I do think it's our job to make us ask the questions. If this show does that in some way, I think that's a really positive thing." In early October, Netflix canceled a New York Comic Con appearance for The Punisher and postponed the show's debut after the mass shooting at a Las Vegas country music festival that left 58 dead and more than 500 wounded. Bernthal said the Netflix decision was "the respectful thing to do" and "the right choice." Then, just a day before a red-carpet premiere in Los Angeles, 26 people were shot and killed at a church in Sutherland Springs, Texas. Bernthal called it "another unbelievable tragedy" committed by an "absolute disgusting coward." But the actor said The Punisher will look at "many different sides" of the gun control debate. "We have to start realizing there's a serious problem here and we have to start opening dialogue on it and we have to stop being completely rigorous and steadfast in our political positions here," he said. "Start addressing the problem and start opening our hearts and minds toward each other and we've got to start working on this." The Punisher premieres Nov. 17 on Netflix.